This dense, moist, savory cornbread is abundant with pungent onion flavor, and just a hint of sweetness. A perfect side to soup, stew, chili, or salad. It's not your usual cake-y kind of cornbread...it is very dense, but not dry. Imagine almost a very firm version of a savory bread pudding. This bread is extremely easy to make (your standard wet-to-dry ingredients), and is baked in the traditional Southern method using a cast iron skillet. The sweetness is due to the addition of honey, and of course the scallions get sweeter as they cook. There's a hint of spiciness from black pepper, but it just adds to the savoriness of the cornbread. 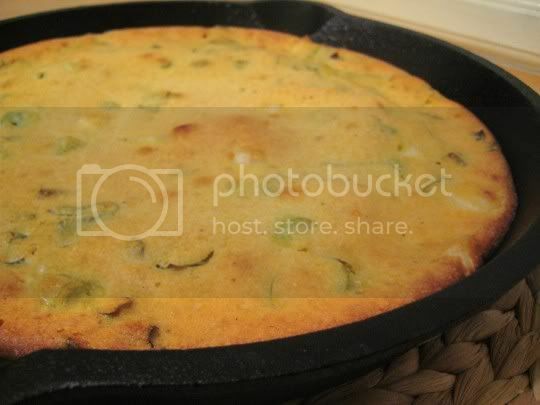 There is a fair amount of oil added to the batter (the recipe calls for corn oil), and then an additional amount added to the cast iron skillet before pouring the batter in. When I poured the batter in, most of the oil in the pan seemed to rise to the top...which didn't look too healthy. But in the end, it worked out well. Maybe it was this extra oil that made the pan virtually nonstick in the end! Make again? Yes, a good, solid cornbread recipe.